It was back in the beginning of 2015 when I decided to quit my office job, which has become a routine and stopped boosting my self-development and giving me satisfaction. I realized that more than that I also needed to ‘restart the system’, in the way we restart our computers, with the only exception that the system was my mind. We all are in a constant search for new inspiration, new ideas, new paths. So was I.
Browsing the internet, I stumbled upon Peace revolution website. Somehow it seemed very friendly from the very beginning – you know that feeling when it’s easy, transparent and clear. I got intrigued by the colourful and happy pictures from the events, interested in the activities and self-development programmes by Peace Revolution, where, in the end, I found lots of helpful information, and it was not some abstract advice but real practical things which could be implemented in life. 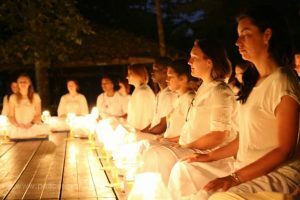 After some time I saw the results and decided to apply for the ‘Global Peace on Move’ fellowship in Thailand as a part of the group of young people from different countries, I was supposed to be introduced to meditation on a big scale – a lot of meditation 🙂 I thought it will be hard to follow the daily schedule we had. And it was! But at the same time after 3-4 days it felt really natural. The fellowship was so much more than just meditation sessions. It was a unique experience which changed my perspective a lot. I met the monks, who turned out to be very open for any questions, friendly and funny, I met many wonderful people with whom I am still in touch, it was very beneficial for networking and discussing future goals and projects, it was a gulp of fresh air and serene nature on a beautiful remote Thai island. I got so inspired that I wanted to contribute to the whole idea of Inner Peace+Outer Peace = Global Peace. Like that the idea of PIPO in Russia was born. We had a small but very motivated team and not much time to tackle many organizational questions but we made it happen. We gathered around 300 people in two major cities. I think, for the first attempt, the PIPO in Russia went really well. We got only good reviews and feedbacks, and many more people got acquainted with the idea of inner peace and interested to learn more about Peace Revolution initiative. The audience we had was mostly students – 70% of events were held at major universities. 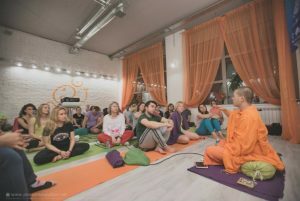 We were happy that people who participated were asking deep questions and we could feel that they got genuinely interested in the topics LP John was covering – stress management, improving concentration ability, improving productivity and creativity, inner harmony as the basis for happiness. Of course, we faced many challenges while preparing the event – from budgeting, finding partners and places till last minute cancellations and changes in the programme, but somehow we managed it all staying calm and enjoying the process. That, I believe, is the most precious lesson meditation teaches you. Next PostNext Nothing ever goes away until it has taught us what we need to know.